3rd Annual Motorcycle Road Racers Reunion at the CSBK Doubleheader features Masters Of Mosport. 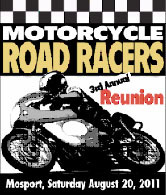 (Toronto) The 3rd annual Motorcycle Road Racers Reunion will be held on Saturday August 20th 2011 in conjunction with the CSBK Doubleheader Weekend at Mosport International Raceway. Eleven prominent racers will be featured as the “Masters Of Mosport” and participate in parade laps during the lunch hour on Saturday August 20th. The Masters Of Mosport riders will also take part in a autograph session where fans will be able to get a signed copy of a special full colour poster that is being produced for the event. Photographers Bill Petro and John Walker have put together an amazing Photo Display of motorcycle road racing photos that highlight some of the great moments in the history of Mosport including the weekends CSBK Doubleheader races. The photo exhibit will also include a special photographic tribute to the late Robb Cooper who passed away earlier this summer. The Motorcycle Road Racers Reunion is a great opportunity for all former racers to meet and enjoy a day of celebrating their glory days as well as watching today’s motorcycle racers in action on the famed Mosport track. You can call the Mosport Ticket Hotline at 1-800-866-1072 (Monday to Friday 9:00am to 5:00pm ET) or visit online at http://www.mosport.com. Tickets are also available at Ticketmaster. The Motorcycle Road Racers Reunion is sponsored by Snow City Cycle Marine and Kawasaki who will have special displays in the Motorcycle Road Racers Reunion area. 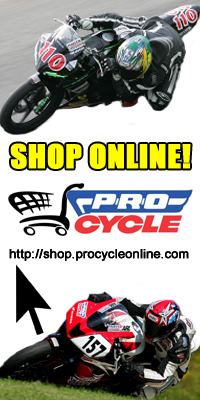 Posted on August 5, 2011, in CSBK - Canadian Superbike Series, General Motorcycle News. Bookmark the permalink. Leave a comment.